So, my Dometic fridge has finally been evicted. I took it out and dumped it in a council waste centre. I was totally fed up of it continually not working see here and here and here and here. I’ve only heard of a few others who have had similar problems but it’s utterly pointless buying a new one as some do as that’s £500 on something that may or may not work and tbh, as it’s been so long of it not working, I’ve learned to do without anyway. So I turned my space into a cupboard. After working out I wanted 3 shelves and the bottom space would take my 2 heavy toolkits, I got some plywood and softwood from BnQ, along with some magnetic catches, hinges, a switch and some led strips etc. 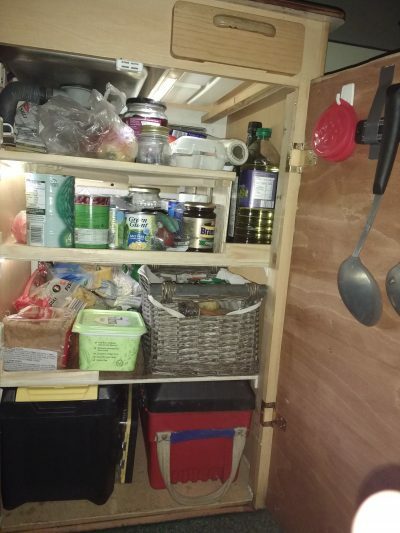 I built it all myself and you can tell because it won’t win any awards for design or build, but at least it transforms the space the fridge used and I am chuffed to bits to have much more food storage space than I had before. The fridge had a usable space of 70 litres. But the cupboard has a usable space of a little over 210 litres. More than 3 times the usable space, not to be sneered at eh? As you can see too I stuck some hooks and a magnetic strip on the door so that things can be stowed there too making even more use of the space. The magnetic strip is taped at the moment to see whether it would be viable and it is so it will be fitted permanently now. As you can see the are at the bottom holds my 2 toolkits and various other tool-ish odds and ends but the rest is all for food. I do think I had a stroke of genius making that tall area at the top right, That’s where all my taller bottles go. This is a simple idea, but for me a brilliant one as I was constantly shopping as I had no space to store things. The wicker basket is for vegetables, it’s got a muslin liner so it’s a healthy space for fresh vegetables to stop them from spoiling. The 2 vents are of course still there so I covered the inside of them with some sacking so that there is still airflow but restricted, and of course water can’t ingress because of their slatted design. It means in summer things stay reasonably cool, but in winter it’s almost cold in there so food keeps well. Saying that I rarely buy anything now that needs to be refrigerated. The odd time I buy meat I tend to buy it when I need it: I don’t use milk and for experience things like salad cream keeps for months when opened even without being refrigerated. This is definitely one of my better decisions and I am chuffed to bits with it.